"They called him Dummy Hoy, but he was nobody's fool. He could steal his way around the bases and score! And while he couldn't hear the cheers, he could sure see them." Even though by 1817 the first American School for the Deaf was up and active, and the American Sign language (ASL) was adopted from the French Sign Language (FSL), "Dummy" was a common name given to people who were unable to hear or speak during 1800s and early 1900s. William was not born deaf, he lost his hearing after a bout of meningitis at a young age. After William graduated as valedictorian from the Ohio State School for the Deaf, he continued playing baseball while working as a cobbler in between season. He set and broke many baseball records and truly gave his all to the game. By working with the umpires, William helped them develop a number of hand signals that later became official in baseball. 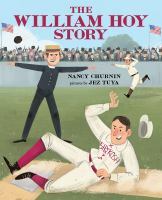 The picture book captures William's lifelong passion for baseball while showing us his upbeat attitude towards life. While not a true life story, the author shares that this book was inspired by a boy she met while trekking in Mount Everest region of Nepal, who communicated quite well even if he could not speak. 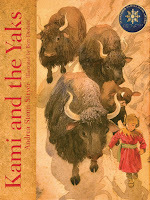 One fine morning, Kami notices that their beloved yaks have not returned home from their grazing. Kami takes out a whistle one of the climbers had given him, and blows it hard. 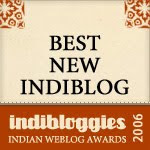 Even though he could not hear the sound, being deaf, he knew the yaks would hear it and come home. But, when they didn't come home after repeated whistle-calls, he decided to go look for them as his dad and brother were guiding another group of climbers. Kami's dad and older brother worked as guides and helpers for mountain climbers, often setting up camp and cooking for the climbers who aimed to summit the mighty Everest. Amid rumbling thunder and threat of a blizzard in snow-capped slopes, Kami's resourceful attempt to save a young yak stuck in a crevice and to lead the small herd home safely is told in a strong and uplifting way. The illustrations are gorgeous; the text projects the urgency and direness of the situation, and we read holding our breath, willing Kami to succeed in bringing some help to these stranded yaks. Which he does. And we heave a big sigh of relief when we see Kami proudly leading the yaks down the mountain, his father and brother assisting him after an arduous rescue.